If you’re a fan of the original muscle-car era (and who isn’t? ), we have a tremendous opportunity for you. 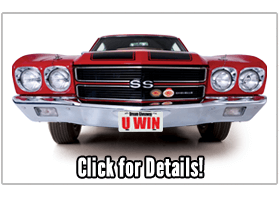 We’re giving away a fully restored Chevrolet Chevelle Super Sport from the most-revered production year in muscle-car history. This grand-prize 1970 Chevelle SS396 is one of the rarest muscle cars on earth. Documented as one of only 2,144 L78 big-block Chevelles produced early in the 1970 model year, it is extremely desirable today. The L78, Chevrolet’s solid-lifter engine option, was a special-order only motor rated at 375 horsepower but capable of up to 500 horsepower. 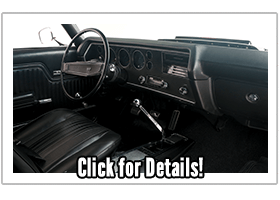 In cooperation with National Parts Depot, a premier coast-to-coast retailer of Chevelle restoration parts, this Chevelle SS396 truly looks like a trip back to 1970. How nice is its restoration? It was awarded the coveted Antique Automobile Club of America (AACA) Grand National Champion, an accolade reserved only for the nation’s finest restored classic cars. Bathed in factory-correct Cranberry Red paint with a black, bucket-seat interior, this grand-prize Chevelle SS396 was born the ultimate muscle car, including the L78 big-block 396, close-ratio four-speed transmission, functional Cowl-Induction hood and Positraction. This is a fully documented 1970 Chevrolet Chevelle SS. It comes with its original build sheet verifying its authenticity and the original sales order form from the ordering Chevrolet dealer. 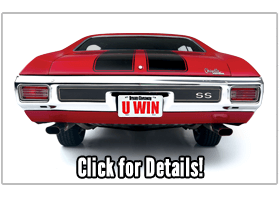 Your opportunity to enter and win this fully restored, rare and national-award winning 1970 SS396 L78 Sport Coupe is now, but don’t wait to enter. Chevelles this nice only come around every 50 years or so and we wouldn’t want you to miss your chance to buckle up in this magnificent muscle car and drive it home. Plus, we’ll pay $10,000 for the taxes. 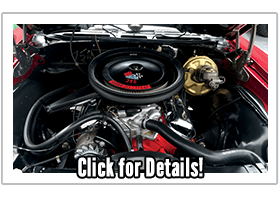 Since 1976 National Parts Depot has offered quality restoration parts Chevelle/El-Camino, GTO/Lemans/Tempest, Camaro, Firebird, Chevy and Ford Trucks, for Mustang, Cougar, Bronco and Thunderbird. For top-quality parts, in-stock and delivered FAST from our four warehouses nationwide, nobody beats NPD’s speed and service. For your free catalog, go online www.nationalpartsdepot.com or call toll-free 1-800-874-7595. NPD… "Make your Dream Happen"